The popular, offbeat and Emmy-nominated NBC sitcom may be headed for the end of its run. 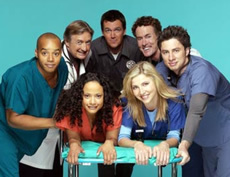 Though the popular Scrubs is currently in production on its sixth season (which should begin airing in late 2006 or early 2007), series star Zach Braff (J.D. Dorian) has doubts about the show continuing to a seventh season. For those that don’t know, television networks produce shows through their own production companies as well as license them from other companies and studios. Touchstone is part of the Disney company which also owns NBC’s rival network ABC. By producing a successful show like Scrubs for NBC, Touchstone is actually hurting its own sister company ABC. So will that cause the end of Scrubs? Hard to say. If the show remains popular and financially feasible, the show could potentially continue on NBC or even move to another network, presumably ABC. But would rising film director Zach Braff and creator Bill Lawrence be a part of it? 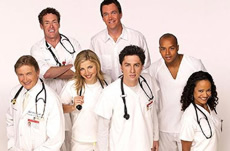 That sounds doubtful and watching Scrubs without them would be a tough pill to swallow. 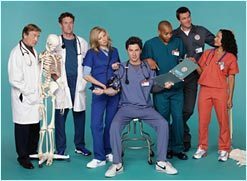 i love scrubs but only because of zach braff the girl who play elliot the girl who playscarla the guy who plays turk and dr cox and janitor and kelso. and even ted all of them must be back pleeeeeeeeeeeeeze i loved it i really didppleeze dont end it i beg you!!!!!!!!!!! SO i’ve watched scrubs since the very first year that it has been on and i own all of the dvd’s. It’s the only show that I’ve remained loyal to, and seeing it go might just be the end of television for me.